The time has come to sum up my impressions of the Terra Nova Laser Photon. When I bought it last summer it was the lightest double skin backpackingtent on the market. I have used it both as a tent and as a tarp and it certainly has its advantages. And some disadvantages as well. As can be seen from the photo the Laser Photon is a hoop tent similar to the Hilleberg Akto. Hilleberg claims that theirs is the worlds most copied tent. They could be rigth. Like with the Akto the inner tent of the LP is attached to the fly and a couple of struts at each end of the tent that ensures that you get some space over your face and feet while being supine. The inner tent is ripstop nylon next to the ground and mesh higher up. A pretty good solution that helps venting and still keeps the cold wind off your body while you are sleeping. There is a foretent with adequate space for cooking and storing gear, providing you do not have that much gear. But if you do you might not be into the Laser Photon anyway. I found the tent a bit tricky to erect with a good fbric tension all over. I ended up not using the bungy loops provided for the tent pegs and putting the pegs through the cross grain loops holding the bungys instead. The pegs themselves seem to be a perennial laughing stock among users. They are very tiny and did not work well in Lapland. They probably work better on a good lawn behind your house. Instead I used my regular combination of pegs; mostle sheep shanks titanium and a couple of sturdier pegs where needed. The tiny pegs that come with the tent might work if you regularly put rocks on top of them to keep them in place, but I do not feel that the 5 grams per peg or so that you save by using them is worth this effort. Another piece of less useful material was the protective sleeve for the hoop. A heavy and pretty amateurish addition to a nice tent, in my opinion. I skipped it completely, saving a bit of weight. Instead I mixed a bit of silicone from the building shop with white spirits and seam sealed the loop channel. So far no leakage in spite of quite a bit of rain. The best thing in my mind about the Terra Nova ultra light tents are that they offer a light solution for backpackers who have a difficulty adapting to the thought that mountaineering tents need not be double tents. Many Swedish backpackers do not believe that anything but a double wall hoop or tunnel tent will keep them alive in the summer mountains. Interesting, since lots of people used single fabric A-frame tents while hiking in the mountains all over the world 40-50 years ago. My current favourite tarptent is the Gossamer Gear The One, which I have used extensively. A couple of years ago I hiked 500 kilometers through the southern parts of the Swedish mountain range during three weeks with The One. It weighs 490 gram, which can compare to the 775 grams for my slightly stripped down Laser Photon. Pegs not included, but loop included for the Laser Photon. For The One I use my hiking poles as tent poles. I find this slight difference in weight between a light single skin and a light double skin tent very impressive. In my mind this actually means that the weight difference between the two is of no great practical importance unless you are obsessed with using the absolutely lightest gear. Which I am not. So it is really more a question of preference and not weight if you choose the Laser Photon or a tarptent. But more on that later. I always feel that the derogatory "gram hoarder" is only used to paint a riduculous picture of people that want to have light gear. Personally I claim to be a "kilo hoarder", which puts things in a better perspective for most people. They realize that they can save many kilos, which is meaningful, instead of a few grams, which is ridculous, by looking at lightpacking as an alternative. But since I have hoarded most kilos available, from a baseweight of around 18 kilos 8-10 years ago, to about 6 kilos today, I do not feel any extreme need to save another few grams. Using the tent as a tarp. Wet breakfast in Vålådalen. I also think (I have not encountered storm winds in either of these tents) that the Laser Photon will withstand higher winds on the tundra than the GG One. So to sum this advantage up; the LP is a double wall tent that weighs slightly more than the very lightest single skin tarptents on the market and also has a good track record from other users for holding up well in strong winds. This means that it is definetely an alternative for the weight conscious but not too adventorous hiker. Still, I would bring the GG One 9 times out of 10, compared to the Laser Photon. Why? Simple answer: Ventilation and condensation. Add to this that the One is similar to using a tarp with the foretent rolled up and is easier to erect and use. The "strut vent" can be used except when the weather is really ferocious. In my mind there are two major disadvantages with the LP. One is that it lacks vents, the other is that the innertent door is turned the wrong way around. Starting with the vents you can in fact improvise some vents, like on the photo above. You simply hook the bottom end of the croos grain loop into the small carabiner on the inside of the fly. Doing this at both ends lets air flow through the tent and minimizes condensation on the inside of the fly. I also always sleep with the main door of the fly as open as possible. If it starts to rain a bit during the night I close it slightly to avoid rain from hitting the inner tent and me. Unless the wind is strong you usually do not need to close the door completely. This modus operandi has allowed me to spend most nights fairly comfortable in the Laser Photon. Condensation has in fact not been much of a problem except when it has been really damp weather. But I would wish for a top vent, and I would be willing to take the weight penalty this would incur. I also used only the fly of the Laser Photon as a very protective and, I suspect, wind worthy tarp for the Vålådalen hike with the Nordic Lightpackers. It is amazingly light and spacious to use it this way and can be recommended. The fly on its own weighs a mere 340 grams including the end struts, and the hoop weighs 154 grams. Almost exactly the same weight as the GG One, but withoug bug protection. Using the Laser Photon as a tarp is excellent both early and late in the season, when there are no bugs. However, during that Vålådalen trip we slept in the forest, where there was no wind. And it rained most of the time, to such an extent that it was no option to leave the door open. So in spite of the makeshift "strut vents" being used, condensation was prodigous. OK, so what at about the door to the inner tent. Well, the door fastens at the bottom and has an arched zipper. This means two major disadvantages compared to the tent doors that fasten at the top and has a zipper at the bottom instead; L-type. One; when you want to get into the tent in bug season you have to open the whole great hole and crawl in, compared to crawling through a hanging curtain that will just open enough to let you through, hopefully scraping some mosquitous of your back in the process. The second disadvantage of this particular tent door solution is in my mind worse. When the bugs are swarming I like to sit in my tent and cook in the foretent. This is also nice when the breakfast weather is less than inviting. It is then perfect to have a curtain of mesh hanging down, and having the zipper at the bottom unzipped. Very few bugs will find their way in down there and you can stick your hands out and stir the pot or whatever. The "non-curtain door" of the LP makes this impossible. In order to use your hands close to the ground you have to open the whole gate, from top to, almost, bottom. The bugs do love that, I will tell you. Packraft and Laser Photon on a bright summers evening, near Abisko, Lapland. To sum things up I find the Laser Photon a pretty good double wall tent, that feels reasonably safe and comfortable. Sacrifices have been made to save weight, you cannot expect everything and also low weight. It is a suitable tent for hikers who do not feel comfortable with a single skin tent or a tarp in the exposed areas of northern Scandinavia, but still do not want the weight of a 4-season bomb proof contraption for use in summertime. Since last year Laser Photon has been replaced by the even lighter Terra Nova Laser Photon Elite. Keeps you wondering what superlative will be added to the next edition. Superduper? Anyway, Terra Nova has managed to shave another 100 grams or so, which is impressive. I like the fact that GG have been foresighted enough to offer Easton aluminium poles for those of us that do not use trekking poles - thus, The One is viable shelter for me. I did think about the Laser Competition but, in the end, it was not what I was looking for and I bought the Vaude Power Lizard UL to test out. I was right not to get the Laser as the Power Lizard layout was not for me (they are the same but the PL is somewhat bigger). That's why I now use the Big Agnes Fly Creek UL1 which I love. At 970g, it is 226g heavier than the 754g set-up I would require for The One, but I wonder whether The One would be as obdurate in strong wind - pitched with the back to the wind, the Fly Creek has the right shape to bleed off wind and has a very stable poleset. The major disadvantage with the Fly Creek is, unlike The One, you really couldn't cook in the porch in the rain as the slope of the porch door is sharp. It would be possible but risky - you don't seem to have that problem with The One. Also, there seems a lot of room in the inner in The One which is a boon. Yes, I like The One and cooking outside (the vestibule is rolled away as often as weather permits) works very well. And there is plenty of space along the inner wall for my gear and food. The kind of fly doors that let rain into the sleeping area is not one of my favourites. As you add a couple of hundred grams you are likely to gain in wind stability as well. I have been looking at the Laser and the Power Lizard as alternatives for hiking with my 11-year old son, but this summer I will be using a Hilleberg Rajd for this purpose. According to people I know the Tarptent Scarp also seems to be a very reliable tent in this weight segment. Have a look at Robin's blog Blogpackinglight which has great reviews of the Scarp 1 and his modifications as well. It seems a light, solid, 4 season tent. Yeah, I like his mods. Scarp would be interesting to test, but I feel it is on the heavy side for me for 3-season use. Could be an alternative for winter use, with solid innertent wall. More spacious but a bit heavier than the BD Firstlight I am using right now. The Scarp 2 looks actually more interesting as a light and stable 2-person tent. If you're look for 3-Season, how about the Fly Creek UL2 or Copper Spur UL2 if you want two porches...? The Fly Creek 2 looks impressively light. Do you have any info on the width and breadth, I couldn't find any on the webpage. Definetely a lighter alternative to the Scarp 2 if it is not too tiny (I am 190 cm). Nice review. I own a Scarp 1 and would say the Moment would offer more for you on the Tundra with its cross over pole and wind shedding profile than it foe three season use. I use to have a Laser Competition and it was good in a strong winds small pole pitched end into the wind. The Photon makes sense as a choice to a person taking light compact kit. There would be little kit stored in the porch. As for me a DuoMid and Scarp 1 cover all my shelter needs at the moment. Jorgen are you books published in English? Porch is 52" (132cm) wide at inner door and 32" (81cm) at fly door and 24" (60cm) between in depth. The inner is 52" (132cm) at the door (head) end, 42" (107cm) at the foot end and 86" (218cm) long. It is 38" (97cm) high. The whole tent, including porch, is 86" + 24" = 110" (279cm). Hope that helps but you can get the image here: http://www.bigagnes.com/Products/Detail/Tent/FlyCreekUL2 and click on "specifications". Size seems OK, a bit short for me, the Hilleberg Nallo is 220 cm, and is to low at the foot end, my feet scrape the ceiling, but the BA seems to have a wall at that end which is more vertical, that might do the trick. Will have to look into those tents. The Moment really looks interesting, and stable for tundra use. Especially the quick setup makes it interesting, even for winter use. But for winter up around our mountains I would prefer a non-mesh partition. The fact that it weighs more than the Laser Photon is a minus however. Seems to me that Tarptent is moving up in weight but also in comfort/stability. 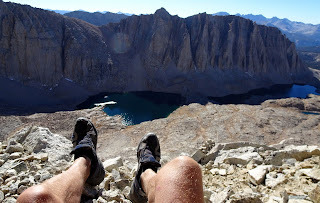 I know Chris Townsend really likes the Scarp, which carries a lot of weight with me, since he is familiar with hiking in our neck of the woods. I will shortly publish an interview with him on a long walk he undertook in Norway and Sweden in the early 90's. One of my books is being translated into English right now, but so far both are only found in Swedish. I hope it will be published this fall. 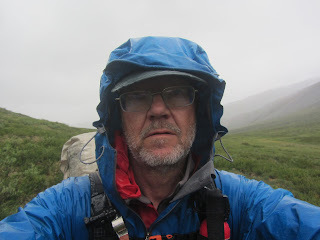 Jörgen - have a quick look at my blog if you get time - on the top part where all the permanent pages are, I've done an article on shelters & I'd like to get some discussion going do anyone seeing the article can get the benefit of the experienced walkers' opinions on this topic. Interesting article on shelters, well worth a read. I've added a comment. I like the drop down door on the inner, but haven't used it when there have been a lot of bugs. First. Thanks for your thoughts. Next: What is a good example of "a 4-season bomb proof contraption" that you'd consider should you need it? When did Hilleberg start manufacturing Akto? I bought a Macpac single-hoop tent, similar to Akto, when I was in New Zealand in 1991. But maybe that was already a Hilleberg-copy? The Macpac tent is still functioning well, but still weighs over 3 kilos (two person tent), so its hardly "light as a feather"... "
I do not know when Hilleberg started with Akto, although I can well believe it was least 20 years ago. Who was first is very difficult to say when it comes to different products. Usually several companies or individuals make the same claim. I have in some situation heard someone from Hilleberg say that it is the worlds most copied tent, but that doesn't necessarily make it so. Maybe it is not even about being the first with the tent but the first to become successful enough to encourage copying. Fjallraven made a tent in the 60's that was essentially Akto with a single pole. 1,5 kilos, but so low in foot and head ends that a tall guy like me basically couldn't use it. The low ceiling in the ends is actually the drawback with the Macpac Eclipse as well, and I've noticed that the more modern single-hoop tents have solved that with an extra pole at the ends. Yes, most of them raise the ends, one way or another. I have no experience of the Vango you mentioned. It looks intersting. A bit heavier than Laser Photon, but looks better ventilated. A very interesting tent coming next year is Nordisk Telemark 1-2. A two person double wall tent weighing around 900 grams.